I work on 15th when my wife called me that she feels numbers of contractions. I finished my job and try to return as soon as possible. Luckily I works with peoples who understands my position and condition. Thanks for my colleagues and vendors. I gave the task for next days to my vendors and explain everything what he need to do. Calmly but nervous before I rushed home. I brought my wife to Dr Teo Clinic, a gynae doctor in town. Dr Teo pamper with words and he confirmed that the contraction is just a false alarm. He asks us to come again tomorrow to check again or if the amniotic fluid breaks. So then we return home, relaxing. No sign of any birth pain. A bit nervous but still controllable. Next morning, again we meet Dr Teo and ask for consultation. He said to check-in his ward at 5 pm onwards and bring cloths and any needs because the time is near. We checked-in our ward that afternoon at 6 or 7 pm on 16th Oct. I told my wife, it would be great if she deliver today on my birthday. It would be a celebration two in one day, a present for me. She just smile. After nurses examined my wife we been left. Every half and hour they come and examine. Every hours come so near to the time. At 2:30 am 17th Oct 2008, the time has come. I followed them inside. 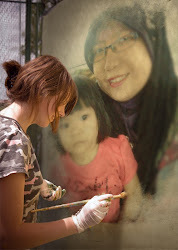 What can I only do inside the labor room is, holding my wife hands and said what ever she want to hear. Actually I dont know what to do and what to feel. It pretty messed up. 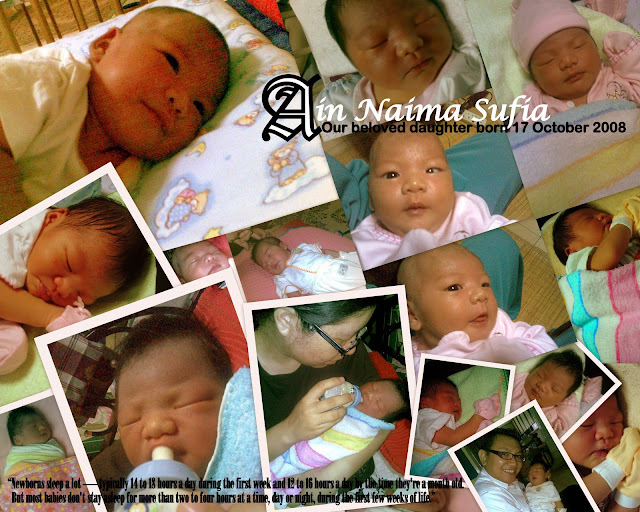 huhuhu... Then Ain Naima Sufia born on 2:42am. Thank you for your support at that time. It’s mean a lot to me. Actually, I’m very lucky to have a hubby on side of me at the critical time if compare to others who their husband can’t accompany his wife in labour room. Hopefully, the 2nd baby, you will be with me also and not on your travelling day. i will be there, sweetheart..